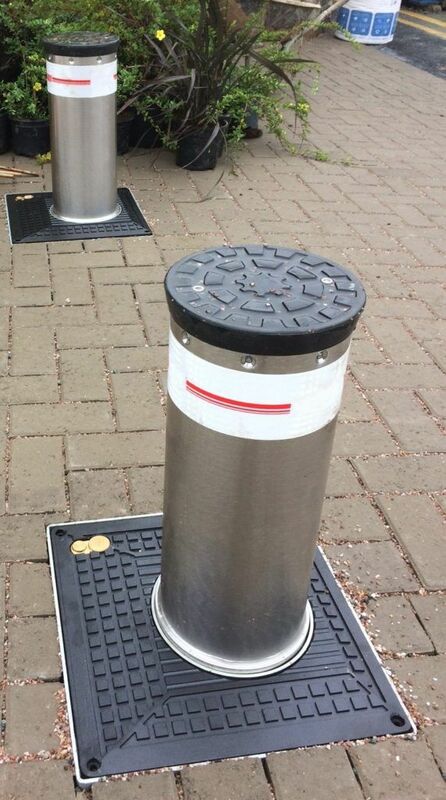 Macs Bollards have recently completed another automatic rising bollard system, working alongside Waterstone Homes. The installation at the Former Kinloch Hotel in Tenby, southwest Wales, has included the implemented of an automatic bollard system to improve the safety, efficiency and vehicle control of a car park for the use of visitors and their vehicles. The application consists of two Macs Vigilo automatic telescopic bollards, in 200mm diameter and 500mm high, in a stainless steel finish. More information on the Vigilo automatic rising bollards can be found here. A keyfob and receiver access control system is positioned on one side of the bollard station which will allow and regulate traffic access from one direction. The road width at the bollard station will enforce priority, and allow only one vehicle at a time to travel through the system. All traffic will be controlled via the Transceiver system with in-ground vehicle induction loops and flashing LED lights for additional safety. If you have a similar application, where the need for security bollard or perimeter protection arises, call or email us today and we'd be happy to assist.